Crowds are now back to the size they were in the immediate post-war years following nationalisation, when they celebrated the defeat of the hated private coal-owners. This mother of all miners’ galas, featuring both picnics and demonstrations, was the labour movement’s most prestigious public platform. The miners formed the bedrock among the proletarian, trade union and socialist ranks; they made up an army of labour that was strategically placed in terms of their bargaining power and influence – the politics of coal dictated much of politics per se. The position of the miners in the class war sent waves across the broad labour movement. To appear on the platform of the Durham Miners’ Gala, or Big Meeting, was often to announce a forthcoming leadership challenge within the Labour Party or within the NUM or other union. It often signified a challenge to current policy or direction; it tested attitudes, prepared for forthcoming militant action (or its opposite). These crowds, these unions in general and this union in particular were for a century or more the presidium of the labour movement’s soul. In the tradition of the Chartists, miners held mass rallies on moors and fenlands – often they would march from the various lodges all day to reach the Big Meeting, to express their outrage at the impositions and injustices of the coal-owners and to announce their united resistance. 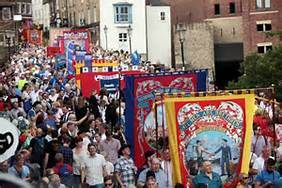 With the Durham and Northumberland miners’ associations firmly established and here to stay, the first actual Durham Miners’ Gala in 1871 preceded the foundation of the Miners Federation of Great Britain (1889). Previous attempts to build miners’ unions over the preceding two centuries had been ruthlessly suppressed through violence, lock-out and starvation. There were over a million coal-miners immediately preceding World War I, when the world’s biggest ever single-industry strike was launched. The Durham miners made up no less than 200,000 of them – they were often highly political and militant class warriors, for whom the union was the soul of their communities. The gala has always picked its guest speakers through the democratic vote of the lodges. Irish republican speakers were popular guests in the early years, reflecting the influence of the Irish in the northern mines, as well as a deep political sympathy and sense of solidarity. Its star-studded platforms have featured everyone from Russian anarchist Peter Kropotkin to, among rather more recent popular and regular speakers, Arthur Scargill, Tony Benn and Dennis Skinner. But the gala is no platform for back-slapping, mutual appreciation: vexed speeches and tub-thumping, fierce arguments have been no stranger to this platform. In 1914 Jim Larkin of the Irish Transport and General Workers Union denounced the leaders of the Durham Miners Association and urged the miners to turn them out. Members of the Communist Party wearing Red Army uniforms had blocked the stairway to the platform to men too ‘moderate’ in their view. Debate has often been fractious, such as when a left leadership emerged and challenged the old-guard constitutionalists, or when moderate Labour leaders attempted to sell us restraint and collaboration – as with James Callaghan’s social ‘con trick’, a policy which saddled us with the ‘incentive scheme’ that helped cripple united action in the miners’ Great Strike of 1984-85. Sometimes it was foreign policy, as when George Brown was heavily heckled over ‘the special relationship’ with the US of Harold Wilson’s government during the Vietnam war. Turning fiercely on a young miner in the crowd with a cloth cap and shoulder-length hair, Brown suggested: “If you’d have your hair cut, young man, we might be prepared to listen to you.” The crowd of tens of thousands looked round at the lad, who silently and without further comment removed his cap to show a completely bald head, rendering Brown speechless among howls of laughter. After Neil Kinnock’s shameful fence-sitting and ballot-mongering during the 1984-85 strike, he was nonetheless booked to speak in 1989 – the bands marched straight by instead of playing the customary piece in the leader’s honour. Worse, when he took the platform, the entire crowd of men, women and children – thousands upon thousands of them – simply turned and walked away, leaving a near empty field, and a deeply embarrassed Kinnock. It was years and years before another Labour leader dared to accept an invite. I was with Davie Hopper, the Durham NUM general secretary who sadly died a week after last year’s gala, when a message was received saying Ed Miliband would be prepared to speak at the gala in 2013 – but not if Bob Crow was on the same platform. The air was blue – Dave made it crystal-clear that it is the Durham NUM who decide who speaks on our platform, not the Parliamentary Labour Party. In case you were wondering, it was Bob who spoke. But the gala is more than just a political meeting. It is a pageant of our collective history – the banners and their themes record the struggles since the 1700s; key players now long since gone, key turning points of history; and our progress. Each decade a new pattern was woven into its collective tapestry, scenes from 1984-85 now join 1832, 1926 and all stops in between. As miners’ children we learned our class history – it was often said that as a pit-village child you didn’t get stories of ‘Goldilocks and the three bears’, but rather ‘Churchill and the general strike’. It is a case of great and great-great grandparents, generation on generation. I was carried to Durham on my Da’s shoulders, as he had been on his. But now the link is broken – no more sons and grandsons follow their forebears down the pit or add their own pages to the miners’ history. The last Durham coal mine closed in 1993 following the defeat of our last stand against John Major’s and Michael Heseltine’s ‘final solution to the problem of the miners’. They quickly demolished headgear, colliery buildings, pit heads and heaps, and tried to wipe us from memory, tried to make us become simply part of some amorphous, undifferentiated ‘new service’ workforce, tried to destroy who we were. Many thought the gala would die, for what was its purpose now? But the Durham miners and the Durham villages refused to go away, refused to abandon their class and tradition. Banner groups were formed, the bands played on: the mission of the gala – the cause of labour and the unions – remained. Under the leadership of the two Davies (Guy and Hopper) the gala has gone from strength to strength. Inspired by its dogged determination, I christened the last book of my Stardust and Coaldust trilogy Ghost dancers. The ghost dancers made up the revivalist, political-spiritual resistance of native Americans, who believed that, if they dressed in their traditional manner, held onto their own values and principles and kept on dancing and beating their drums, the white man would lose his power, the buffalo would return to the prairie, and they would be able to claim back their culture and land. Ten years after the closure of the last Durham mine, 55,000 pit folk and their friends followed their bands and banners through the thronged street of Durham. The big drum was still bashed, the martial music rang out and miners like guardsmen proudly carried their banners high in the wind. I thought ‘ghost dancers’ – as long we keep parading, keep bashing those drums, stick to our values and culture, the pits will reopen, the Tories will be no more and Arthur Scargill will walk on water again. Well, perhaps not quite, but the case for deep-mined coal and the need to revive our industry and reclaim our union from the bureaucracy and the museum is as strong as ever. Somewhere on Jeremy Corbyn’s long ‘to do’ list, we are hoping, is resurrection of the industry. No, not a million miners again – we’re not stupid – but at the moment 40 million tonnes of heavily subsidised coal is imported for British manufacture and power, when we could mine it here. Coal power is still the cheapest form of energy generation and with carbon capture it need not cost the earth. But the gala is much more than that. It is also a place for the young ’uns for wild gaanin’s on – ever since the days of the straw boater and blazer (yes, they did) and miners’ girls dancing the Charleston in their flapper dresses and beads to the strains of the band. And from the days when the local press called it the Teddy Boys’ Picnic and when there were mini-‘Woodstocks’ on the river banks and in the woods, this has always been a place where you could strut your stuff and find interesting partners. For the kids, it is a day of funfairs, of numerous stalls, ice cream, burger and chips, and candy floss, of bingo prizes and of boating on the river. It is a day of drinking and bravery – diving into the river from the bridges with your shirt off. Once it was also a day of inter-village fights – thankfully now just a memory. But it is still a day of dancing through the streets – at the end of the day the bands play on and the crowds link arms and dance back through Durham’s streets, while folk musicians recall our musical and lyrical legacy in pubs. This year the banners will be draped in respect of Davie Hopper and Davie Guy – two men who held this union and this event together and ensured the Durham Miners Association is still a vibrant and vital part of the labour and trade union movement. My latest book (soon to be reviewed in this paper, Red banner, green rosette) is dedicated to them and also Dennis Murphy, the late leader of the Northumbrian Miners. They were men who led this ancient and once mighty coalfield in the greatest and most bitter battle of its existence. They ensured that this coalfield and this union would expire with all the courage and dignity our history would expect. If it had slunk off behind armoured buses, put itself at the disposal of Margaret Thatcher and collapsed into a forgotten corner of history, we would all have died of shame. With the help of those blokes we never lost that dignity – or class courage – to the last man standing. This will be plainly evident on those Durham streets. I hope to see you in the field or along the route, or in the evenings in the bar – all in a county where we chew the cud, down some beer and raise the roof in song.